We all get busy this time of year, with one holiday following another. In fact, many folks get stressed out from the hustle and bustle of gift shopping and gatherings with friends and families. But, a holiday hike is the perfect cure for a frazzled brain. Across Alabama you’ll find plenty of amazing trails that wind through calm woods to help you decompress. Whether you’re seeking a stunning mountain view, the soothing sounds of a cascading waterfall, or just a quiet spot beside a placid lake, you can restore your holiday cheer with these 10 hikes. If you’re in Florence in northwest Alabama and you need a holiday break, head to the trails of the Shoal Creek Preserve, where two magnificent trails interconnect and allow you to do loop hikes. If you want to walk for just an hour or so, try the 2.4-mile lollipop loop hike on the Lawson Branch Trail, or a 2.5-mile walk on the Jones Branch Trail. For a longer jaunt, combine the two for a great 4.3-mile double loop. 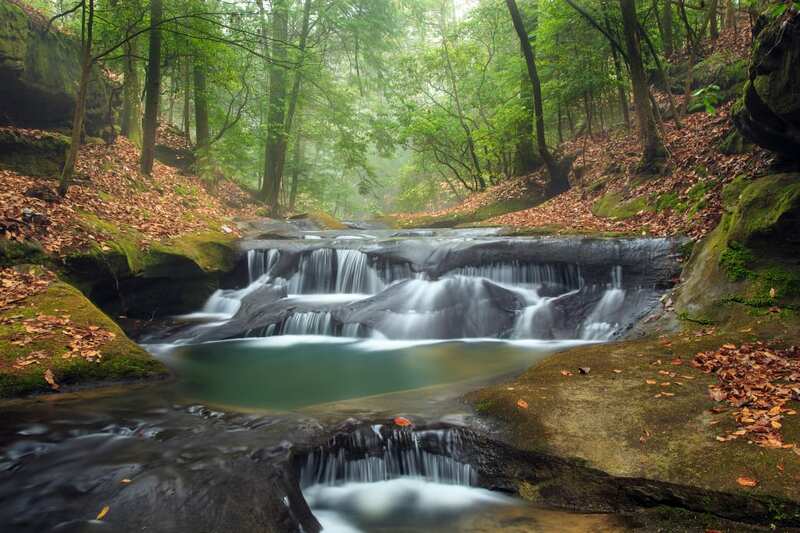 No matter how you hike the preserve, you’re in for a treat, as the Jones Branch and Lawson Branch are home to babbling cascades and other tranquil water features. 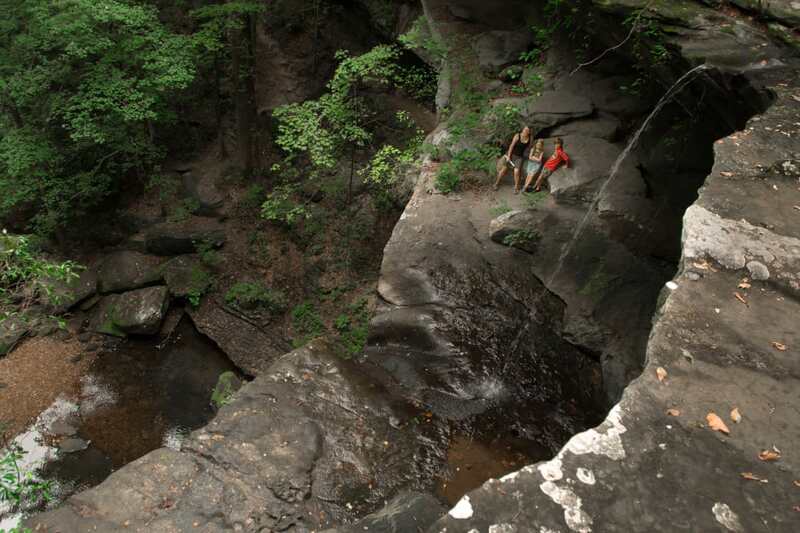 A lot has been written about Cane Creek Nature Preserve and for good reason—the combination of geology, wildflowers, and rushing streams makes this a remarkable site to hike no matter what the season. Located in Tuscumbia, the preserve has more than 15 miles of trails that intertwine, giving you almost unlimited hiking possibilities. Of course, you won’t see a lot of wildflowers during the holiday season, but the landscape more than makes up for it. Take in a panoramic view of the canyon and surrounding hills from "The Point," as hawks and eagles soar around you. Then, make your way into the canyon to several rock shelters, many of which are adorned with tumbling waterfalls. Before you visit Cane Creek, be aware that the preserve has new hours of operation, which you’ll find on its Facebook page. Circling the top of Huntsville’s Monte Sano Mountain, the Plateau Loop runs through Monte Sano State Park and provides nice views during winter. Traversing relatively easy and level terrain, this 5.4-mile double loop is comprised of the 1.9-mile North Plateau Trail and the 3.5-mile South Plateau Trail. The South Plateau leads you to some nice overlooks, the best being the rock outcropping known as O’Shaugnessy Point, which is located about halfway through the loop. The North Plateau takes you to another overlook and a short side trail near the park’s picnic area. If you follow the side trail, you’ll reach a nice waterfall where you can sit and contemplate all of those amazing hiking gifts you’ll see under the tree this year. DeSoto State Park is a beautiful park in and of itself, but add a dusting of snow—as is often the case during the holidays—and it becomes magical. A favorite of hikers this time of year is the Falls Loop, which actually includes three of the park’s trails—Laurel Falls, Lost Falls, and Azalea Cascade—to form a 3.1-mile loop. As their names imply, each is a beautiful waterfall tumbling down the sandstone rocks, offering hikers the sound of a soft, soothing cascade as a holiday gift. Pick a route, any route through the Sipsey Wilderness, and you’re guaranteed an amazing winter hike. Around just about every corner you’ll pass towering sandstone canyon walls with cascading waterfalls. Plus, you can stroll beside the beautiful, clear waters of the Sipsey River. With 45 miles of trails, the wilderness holds a wide variety of hiking options, from easy walks to lengthy, challenging treks. A holiday celebration wouldn’t be complete without a walk through the pines. At the Cahaba River National Wildlife Refuge, you can stroll down an impressive aisle of longleaf and loblolly pines on the Piper Interpretive Trail. 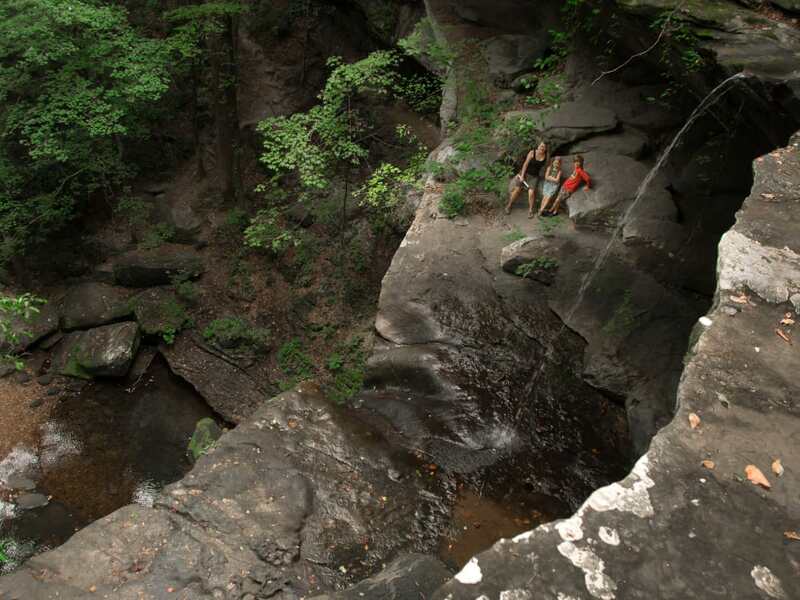 This 2.3-mile out-and-back hike not only leads you through impressive stands of pine trees, but it also visits high rocky bluffs that offer views of shoals on the Cahaba River. To complete a loop, you can return on an old road, but be aware that the road is covered with gravel stones that measure 2 to 3 inches and make walking difficult. Flagg Mountain is recognized as the last mountain more than 1,000-feet tall in the southern Appalachians. Hikers sometimes say that Flagg is "so tall it generates its own weather." Of course, that’s a joke, since the mountain is only 1,152 feet tall. But, it does snow on Flagg, and when it happens the 1.8-mile Flagg Mountain Loop Trail is simply beautiful. 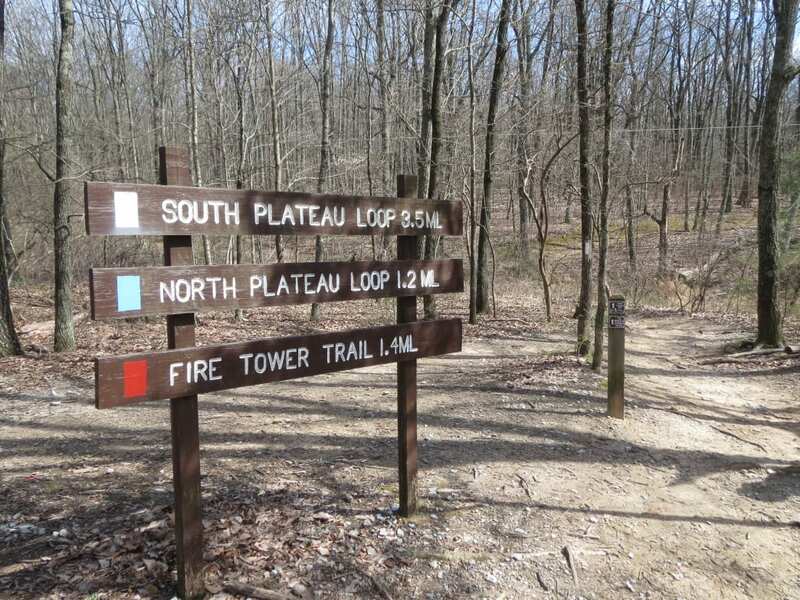 The loop is created by joining two trails, the Yellow and White Trails. 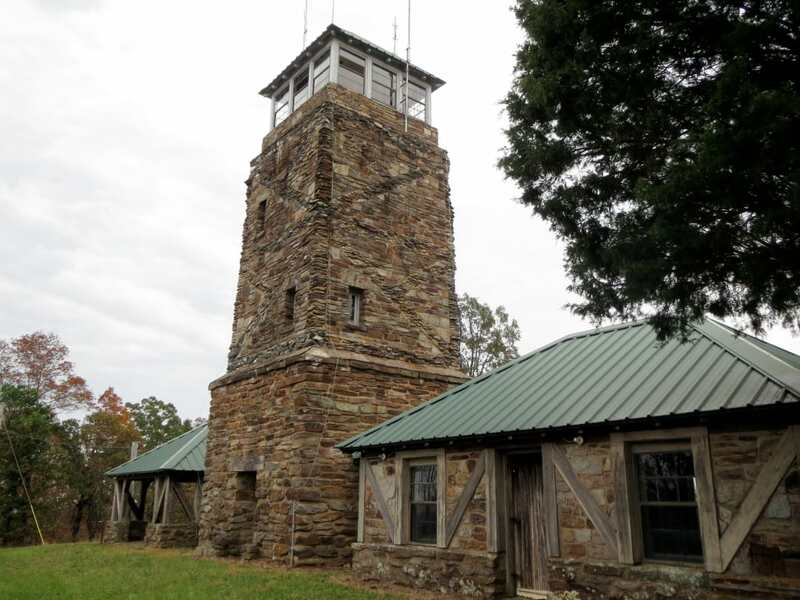 If you go, be sure to add the extra 0.6-mile out-and-back from where the two trails join together to view the 1930s craftsmanship of the Civilian Conservation Corps (CCC). Along this stretch you’ll see cabins made of logs that were hand hewn for a proposed state park that never was. The Conecuh National Forest in Andalusia has several great trails for backpacking and day hiking. In winter during the holiday season, many of the trails are shared with hunters, but you can still safely enjoy this beautiful longleaf pine forest along the Pond Loop Trail. This loop is actually a collection of several different segments of the white-blazed Conecuh Trail, and they stretch approximately 2.2 miles when joined together. To begin the hike, start with a loop around the Open Pond Recreation Area’s namesake, Open Pond. Then, head off to circle the dark, placid waters of Ditch, Buck, and Alligator Ponds, where you might see wood ducks and wild turkeys, as well as Bobwhite Quail darting in and out of the brush. If you need to extend your holiday respite, the Open Pond Rec Area has a 5-star campground that’s the perfect for a good old fashioned family winter campout. If you have plans to visit the Alabama Gulf Coast this holiday season and want to get away from the normal tourist trappings, take a hike along the Perdido River Trail. Located in Robertsdale, the trail is now almost 20 miles long, but the first segment from the south trailhead makes a wonderful 4-mile winter out-and-back hike. The trail follows the banks of its namesake river, which runs along the border of Alabama and Florida. As you walk, you’ll be treated to beautiful sandbars and an Atlantic cedar swamp. Plus, there’s a good chance you’ll see bald eagles soaring overhead. Snow on the Alabama Gulf Coast? Not quite, but close enough as you head to one of the most pristine and secluded beaches on the coast along the Pine Beach Trail. This is an easy 4-mile out-and-back that begins in a maritime wetland and forest. Farther on, it weaves through a series of impressive sand dunes bedecked with waving sea oats before arriving at the snowy white beaches of the Gulf. Be sure to pack a lunch, and about a mile into the hike stop at a two-story platform to view birds and other wildlife. 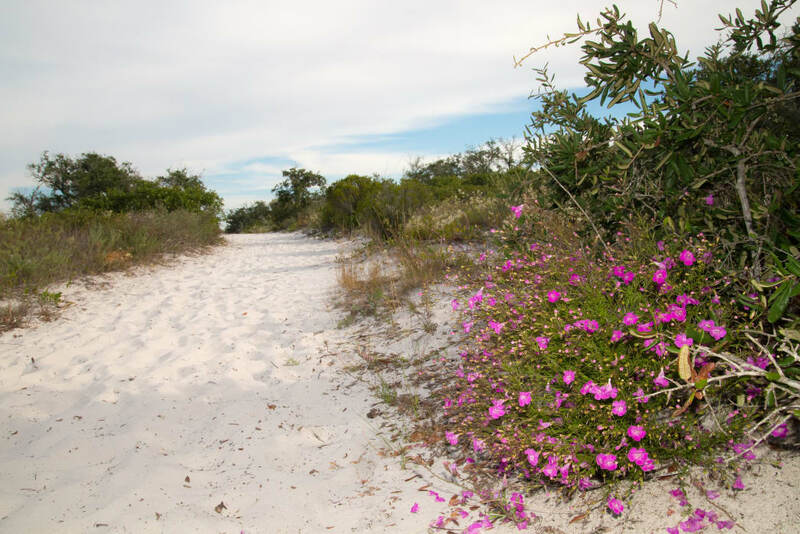 And don’t forget, the dunes play host to many species of wildlife and help protect the mainland from devastating storms. Because of this they are federally protected, meaning you should stay on the marked trail.